Antelope is a term referring to many even-toed ungulate species found in the family Bovidae. The term does not refer to a monophyletic group, as not all members of Bovidae are considered antelope. Instead, the term refers to a ‘miscellaneous’ group within the family encompassing the species which are not cattle, sheep, buffalo, bison, or goats. A group of antelope is called a herd. 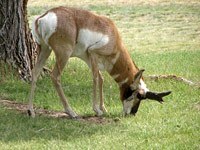 How many types of Antelope exist? There are about 90 species, most of which are native to Africa, in about 30 genera. Antelope are not a cladistic or taxonomically defined group. The term is used loosely to describe all members of the family Bovidae which do not fall under the category of sheep, cattle, or goat. Usually all species of the Alcelaphinae, Antilopinae, Hippotraginae, Reduncinae, Cephalophinae, many Bovinae, the Grey Rhebok and the Impala are called antelopes. 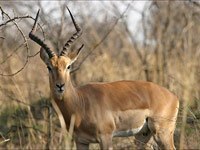 Most species of antelope are native to Africa, but some originate in Asia as well. The Arabian peninsula is home to the Arabian Oryx and Dorcas gazelle. 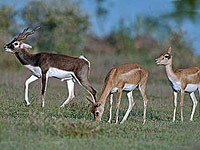 India is home to the Nilgai, Chinkara and Blackbuck, while Russia and Southeast Asia have the Four-horned Antelope, Tibetan antelope, and Saiga antelope. Many species of antelope have been imported to other parts of the world, especially the United States, for exotic game hunting. Due to the spectacular leaping and evasive skills of some species, escaped individuals are not unheard of. 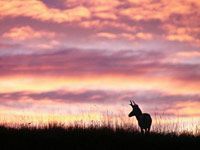 Texas in particular has high numbers of gaming ranches, as well as habitat and climate that are very hospitable to African plains antelope species. 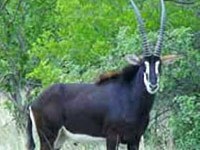 As such, wild populations of Blackbuck Antelope, Gemsbok, and Nilgai have established in Texas, though they are not native to the area. What do Antelope look like? All bovids have even-toed hooves, horizontal pupils, ruminating guts, and (in at least the males) bony horns. 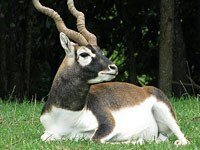 These basic characteristics, however, mask huge differences in appearance between antelopes, cattle, goats and sheep, and among the antelopes themselves. Download free Antelope wallpapers, click on the image to open the large version. Print free Antelope coloring pages, click on the image to open the large version.